More than 1400 business and community leaders braved the cold across the country last night for the 13th annual Vinnies CEO Sleepout. As temperatures fell to single figures, the community leaders feasted on soup and a simple sausage in bread before retiring for the night to get a taste of what it's like to be homeless. The national event is tipped to raise more than $6.4 million for Australia's homeless and disadvantaged. Sydney Auxiliary Bishop Richard Umbers was one of the 350 people who slept rough at the Sydney event at Rozelle's White Bay Cruise Terminal and said it was a valuable insight into how the thousands of people living on the streets exist day to day. On the cold and damp concrete with chilly winds blowing off the water he was given the opportunity to not only reflect on what it's like to sleep rough but to network with other community leaders on what can be done to help. "It was great having the opportunity to have open dialogue with community leaders on how the social teaching of the church needs to be made better known," he said. 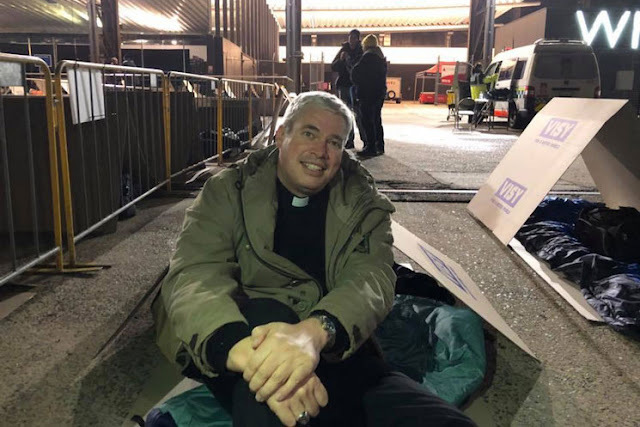 "I took part in the Sleepout as a sign of solidarity with the many Catholic agencies providing essential services particularly for the homeless. "In the current climate there is a lot of criticism levelled at the Church, from school funding to the Royal Commission, people think we don't have much awareness about what's actually happening on the ground and in people's lives. "But there is so much goodness, so much truly Gospel-centred work going on without headlines, stories or recognition of any kind so I wanted to draw attention to not only the homeless but those there who pick up the pieces." NSW chief executive of the St Vincent de Paul Society Jack de Groot has called on the Federal Government to recognise that housing is a human right not a privilege, which he says has been consistent in Catholic social teaching for decades. He said there are many things the community can do to help the homeless including finding out more about the issue and raising awareness, volunteering with Vinnies and making financial contributions to charitable organisations as well as taking part in the Vinnies Sleepout. "The homelessness problem needs to be dealt with and the best way is by bringing people together,"' he said. "It's not just a moral thing, it's intellectual, people need to understand it. "The Sleepout brings all types of community leaders to the table where decisions are made."